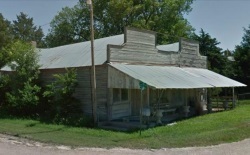 Burr Oak was founded in 1871 by A. J. Godfey. The Missouri Pacific Railroad came to town in 1879 causing a surge in growth, and by April 1899, Bur Oak residents voted 260-10 to build a new school building. 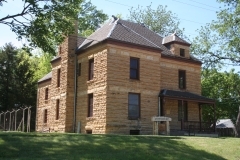 Architect J. C. Holland of Topeka designed the Burr Oak schoolhouse, which was constructed by J. W. Berry of Jewell at a cost of $7,000. The school opened its doors for classes January 2, 1900. 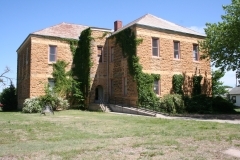 It served as both the high school and grade school until 1916, when a new high school was built. It continued serving grade school students until 1967. It was nominated for its architecture and its association with local education. Built in 1912, the Burr Oak United Methodist Church was nominated as an example of late Victorian-era Richardson Romanesque architecture. 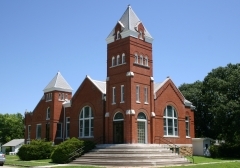 The congregation organized in 1873 and held services and meetings in area homes until 1880 when they built their first wood frame church building. The growing congregation voted for a larger more permanent structure by 1910. They hired prominent Kansas architect J. C. Holland, who had designed the Burr Oak School located one block west, to design their new church building. Built in 1887-1888, the First National Bank in Mankato exhibits many of the influences of the Richardsonian Romanesque style. 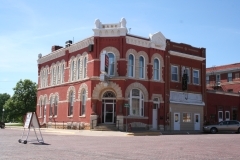 It was constructed of pressed brick on a limestone foundation with limestone trim and a wooden cornice. It has two stories and a basement. A shortage of material delayed construction for a time in November 1887, but by May 2, 1888, operations finally began in the new building. 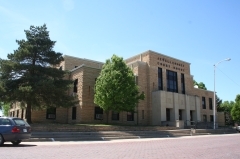 The banking history of Mankato is in many respects closely linked to the history of this building. The building was nominated for its architecture and its association with local commercial history. 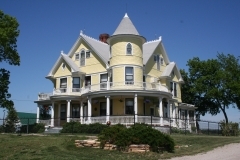 The Oren W. Francis House was built in 1909 by Mankato carpenter John Shand. The three-story house rests on a brick foundation on a hill overlooking the White Rock valley. It has distinguishing Queen Anne features that include a steeply pitched roof, various patterned wall surfaces on the exterior, and a prominent turret. The wrap-around porch is supported by Free Classic Ionic columns. It was nominated for its architecture.